President Xi Jinping has decided schools will be the training bases for the next “Red Generation,” creating the future’s socialists. Education, it has been said, is the most powerful weapon that can be used to change the world, and China’s President Xi Jinping is taking the matter to heart, ensuring that teachers are properly inculcating students with the right ideology—CCP ideology. He repeatedly stressed the necessity of cultivating a generation of talents that will ultimately support the CCP and the Chinese system, and that this must start with schools and children. It was the first time the CCP Central Committee held such a high-level symposium for ideological and political theory teachers. Bitter Winter has time and again reported that the CCP is using schools as a front to promote Party ideology while simultaneously making no room for religion on campuses. Xi Jinping’s speech solidifies that notion. And the evidence of it is pretty much everywhere. 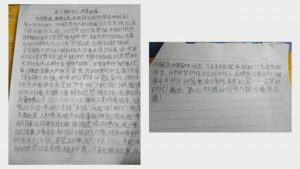 On February 18, at a flag-raising ceremony at Liuxinzhuang Primary School in the Baoping sub-district of Tianjin city’s Baodi district in northeastern China, teachers ordered student representatives to deliver speeches opposing religion in front of everyone. They even demanded students to make sure teachers and fellow students alike know their positions against religion, by posting them to the school’s bulletin board. Since November of 2018, a primary school in Lunan district of northern Hebei Province in Tangshan City demanded that all students learn to recite the Core Socialist Values. School leaders and class head teachers conduct random inspections, and any student who can’t recite them from memory will be criticized and reprimanded. One school principal in the Haigang district of Hebei Province’s Qinhuangdao City said the government now treats “Party-loving, country-loving, anti-religious propaganda” as the top educational priority. Education has now become a cog in the political-propaganda machine in China. And it doesn’t matter whether the students identify as Christians or not—there’s no room for them to succeed in school while maintaining their personal beliefs. “I know that people were created by God, but I didn’t dare to write that [on an anti-religious questionnaire]. I was afraid that if the teacher found out, she would report me and my mother,” one Christian student said. A primary school student found himself in trouble for having written “The church bell rang” in a composition. He was ordered to avoid such references in the future, and write instead that he had heard the CCP Pioneers singing their anthem. 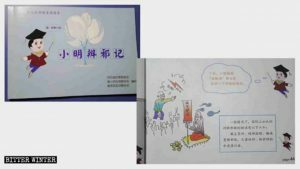 While intensifying the attempt to control students’ minds and guide them to the CCP ideology, authorities are also closely monitoring teachers and inspecting the contents of their teaching materials. After all, Western culture and religious thought—the enemies of “red ideology”—are being purged even more thoroughly from textbooks and classrooms. And even that is now regarded as not enough. According to a document issued by the State Textbook Committee on January 3, under the title Notice on Launching Comprehensive Fact-Finding Work Regarding Teaching Materials for Constitutional Law Studies at Universities and Colleges, authorities will launch “full-coverage, omission-free” fact-finding investigations on how the Chinese Constitution is taught in institutes of higher education. According to Hong Kong’s Sing Tao Daily, the reason for this move by the authorities is that some Constitutional Law textbooks were found to contain content that “promotes Western thought and advocates Western systems.” The State Textbook Committee was set up within the Ministry of Education on July 3, 2017, to manage, censor and formulate the curricula and textbooks for primary, secondary and higher education in China. In November 2018, some teachers in Daqing city received a WeChat message forwarded from the local Education Bureau, demanding not only that religious beliefs be prohibited, but also that Western culture not be allowed to enter the classroom. After this document was issued, one primary school in the county immediately convened a special meeting of all faculty and staff to strengthen ideological education. For teachers who are known to be religious, one-on-one “assistance” is conducted and they are subjected to regular interviews. One Christian teacher at the school told Bitter Winter that his religious status has been registered. After each time he attends a congregation gathering, he must fill out the time and content of the gathering on a Management Ledger for Religious Teachers and Students and submit it to the school. The school authorities have already arranged for a Party branch secretary to supervise and “transform” him. According to a report by The Wall Street Journal, two teachers from the Chinese online education startup VIPKid were fired, accused of using an approach inconsistent with the position of the Chinese government when discussing the Taiwan issue and the Tiananmen Square incident. Additionally, hundreds of foreign teachers have been warned by school authorities against using maps in their classrooms that do not conform with the government’s requirements. 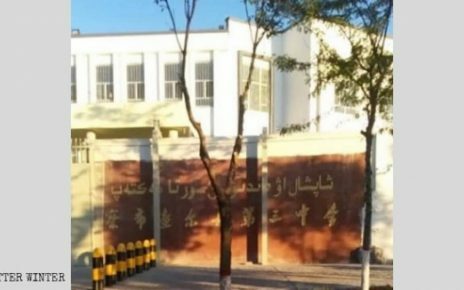 Last September, the director of a police station in the Hanggin Banner under the administration of Inner Mongolia’s Ordos City attended a meeting at a local kindergarten, demanding that all teachers sign a statement promising never to believe in religion, or else they will be considered part of a xie jiao by the CCP. 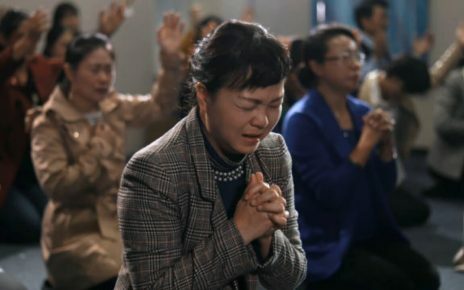 The teacher we interviewed was right: the CCP is terrified of religion.